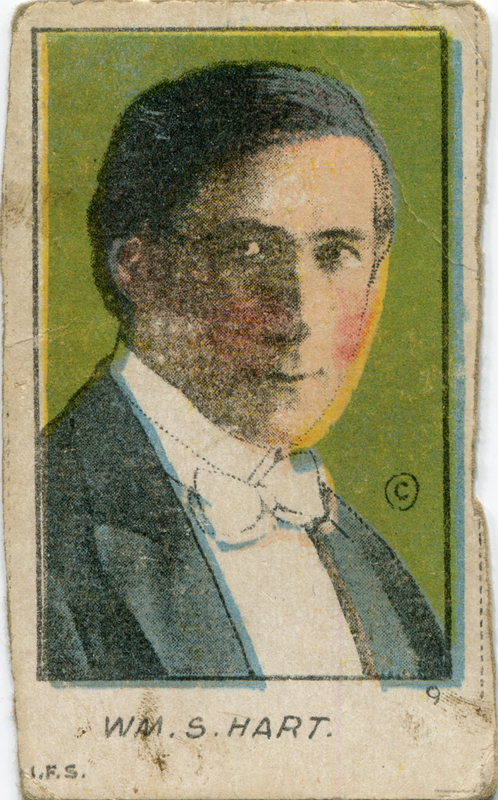 Color strip card showing actor William S. Hart against a green background with "WM. S. HART" in slanted capital letters. One-sided, heavy card stock, 1½x2½ inches, 1919. Unlike tobacco cards, color strip cards didn't accompany a product. They were issued in strips, cut apart and collected or traded. "I.F.S." stands for International Film Service, but that's not the maker or distributor of this card. I.F.S. was started in 1915 by newspaper magnate William Randloph Hearst to produce the cartoons that ran at the end of his newsreels, which were produced by another Hearst company, International News Service. At the time, both newsreels and newspaper comics in motion-picture form were new concepts. The trouble was, Hearst had long been a German sympathizer; German immigrants were his primary target market for his news product. So, during the run-up to the American entry into World War I, the credibility of his newsreels went kaput. Facing financial ruin, Hearst, among other things, dumped his least profitable company — I.F.S. — and fired all of its staff on what came to be known as Black Monday, July 6, 1918. LW2584: 19200 dpi jpeg from original card purchased 2014 by Leon Worden.